Florida pays low across the board nationally, but that area of Florida has been highly affected by the housing market decline and foreclosures. Health care is the only form of "stable" employment that coast has to offer. Good luck. Hello, Congrats to you for taking a step to become a nurse. You stated you want to be a nurse so why delay time by pursuing the PCT route? List your pros and cons and then move forward. PCT work can be labor intensive but why delay 2.5 months of taking the courses you need for your nursing degree? 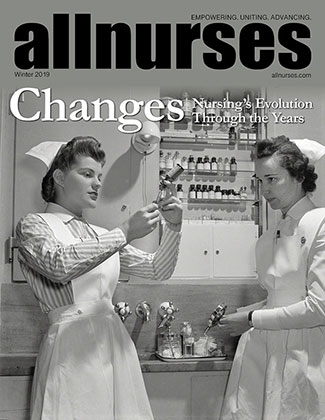 Is The Culture of Nursing Improving? I wish in eight years that I have seen a change but not yet. 81 year old nurse still working strong! No matter how "great" the nursing profession is this not something to look forward to. Let me begin by saying congrats on passing your boards. Do not focus on latter of not passing many years you have passed now and move forward with that. People achieve there goals at different levels. Nursing for new grads is difficult to obtain job placement at this time during the economic turmoils that are taking place. Take the job that arises and move forward. Do not dwell on the length of time it took you to pass and much success to you. Since you seem well prepared to embark on your goal of pursing nursing as a career I want to wish you the best of luck as we always do need more nurses to enter the profession. However, you bring a wealth of experience and just need to acquire the clinical experience. Nursing is a profession that is rewarding BUT can take a tool on you throughout the years so I beg you to think hard before beginning the journey. By the end of the year I will be removing my self from the profession but enjoy. Why aren't there better incentives for obtaining a BSN degree? Professionally, I transitioned from LPN to RN-BSN to MHA/Ed and continue to perform bedside duties and take commands from managers and supervisors that do not have half the education that I have. WHAT is WRONG with that picture. As I strive to branch off into other avenues because of my education level I meet many stop signs in the road and ponder why did I spend time and (loan) money to further my education in this profession. As a WHOLE we need ALL need to look at the BIGGER picture of what is taking place here with this profession. IF a nurse has invested the time to further there educational practice to obtain a higher degree then there is a difference. Such as with EVERY OTHER PROFESSION in the work force that is complimented for there achievement in continuing education. It is really disturbing the misleading approaches facilities take to undermine nurses if you allow them. Yes, they want you to further your education but give pennies on the dollar to do so or nothing at all. People are plagued with REAL life issues that do not always allow then to jump right back into a 2 or 4 year program to continue acquiring loans to have a higher degree to essentially do the same job. I definitely sympathize with your posting and have felt the same way for a while now. I even obtained a masters degree which I have had little success securing a non bedside position because either they go with someone with more experience supposedly or just dont reply. You hear all the time nursing is a vast profession for for career transitions BUT myself and colleagues are not seeing it. DesertKat, I would like to express my sorrow for the loss of the baby. Secondly, your managers and superiors in this situation are unkind and inhumane in my eyes, yes, were are trained to render care to the sick, but at times nurses also become sick or have health issues that arise. Working so many hours a week on a salaried pay scale is not worth it and the facility appears to be taking "advantage" of the situation. How can you possibly give safe care working so many hours? I understand that your are support of your staff and may want to consider prn status there until you embark on a new oppurtunity to have some income for the mean while and decide how you would like to move forward. It seems you did the best thing for your licensure and health by stepping away from the position, because working in such a high stress setting would make it difficult for any woman to carry a child to term. Kudos to you for stepping away. I encountered a similiar experience as a ADON where I felt abused by working 50-55 hours a week salaried and got the blame for majority of the issues taking place with nursing. Not to mention I was "expected" to perform three other job descriptions but I would get one pay check every other week, I left that position without second thoughts. I also agree with taking the insurance job more stable hours and time to spend with your child. A long term goal of yours could be to go into L & D in the future. You are the sole provider the insurance job offers higher pay, RN title, and your hours appear to work with your child's day schedule. How far do you drive for work? You really have to consider your safety to begin with. 12 hour shifts can be longer because things can change with a patient at change of shift unfortunately. However, safety first above all. I have driven a hour and a half and as short as five minutes. The long commute was a killer on my body and family to tell you the truth and not worth it. What will you do after floor nursing? Hello, I do self reflecting also and pondered many of the issues you write about. I went to school to get my MHA/Ed and completed it within the last month. I feel self gratified I will remain in the ICU until the right opportunity arises. However, now that I have an advanced degree the world is my oyster and no one can take your education away from you. Yes, the loans were expensive its an investment in myself to better myself and family. So i dont ponder about the loans, with some things you have to spend money to earn money. Happy Thanksgiving to all! Reason to be thankful: I am not a nurse anymore! I enjoyed reading your post best of luck.